Dwight Schrute is the Assistant (to the) Regional Manager and an accomplished paper salesman at the Dunder Mifflin Scranton branch. ​Dwight generally dresses for success in his business suits, but he has a few pieces of atypical casual wear as well. Dwight’s style is quite unique in that it consists mainly of muted brown and gray toned suits, often times paired with his signature “mustard yellow” shirts. ​Dwight’s jackets are fairly simple and basic, they are usually two button, single breasted dual side vent sport coats. This brown suit jacket by Gino V﻿﻿alentino is an excellent match to the style of Mr. Dwight Schrute. 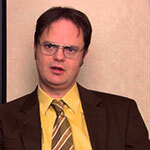 As I previously mentioned, Dwight’s work shirts are often times a sort of dandelion/mustard shade of yellow. That isn’t to say that it’s the only color work shirt he wears however, Dwight has been noted to wear many muted tones of color including: orange, green and even white. ​One detail that shouldn’t be overlooked about Dwight’s shirts are the sleeve length. It has been noted that Dwight prefers the freedom and flexibility of a short sleeve dress shirt. As he makes mention of this when Charles Miner encourages him to wear long sleeved work shirts. Here is a short sleeve dress shirt in gold color with built-in wrinkle resistance that is a perfect match to the shirts of Dunder Mifflin’s top salesman. ​Here is another great match to the dress shirts of Dwight Schrute. This yellow shirt comes in light stone color and is also wrinkle resistant for easy care. ​This three wolf moon shirt is another exact match to the wardrobe of Dwight Schrute. He is seen wearing it after hours while cruising the town with his fellow Dunder Mifflinites. It has been said that this shirt has the power to be irresistible to women, strike fear into other males and it grants the wearer magical healing abilities. ​Here we have a plain white tank ﻿﻿﻿﻿top for men by Russell Athletic, it’s a great match to the undershirts Dwight wears beneath his workwear. Honestly there isn’t a whole lot to say about the pants worn by Mr. Schrute. They are often times simple brown or gray dress slacks with no distinguishing features. There isn’t anything out of the ordinary about the color or style of his pants, or the way he wears them. ​It is worth mentioning however that despite the style of pants Dwight is wearing, he is fast. To give you a reference point, he is somewhere between a snake and a mongoose… and a panther. One thing you should know about Dwight is that he is a loyal devoted employee who puts the needs of his co-workers before his own. Ok, so maybe that last part isn’t quite true, but he is dedicated none the less. One year he was even named employee of the month twice in one month… in lieu of a pay raise. ​That being said, Dwight’s reliable attendance and dedication to his profession would not be possible without the right footwear on which to walk. Mr. Schrute has been noted to wear black leather oxford dress shoes. Which is surprising when you consider just how many shades of brown he has worn throughout the course of the series. These black leather oxford dress shoes by Bostonian are a great match to the shoes of Dwight Kurt Schrute III. Dwight has been noted to use numerous different accessories and even weapons. Ahead you will find only the most important of such items that are crucial for completing any sort of Dwight Schrute cosplay. ​Here are some silv﻿﻿﻿﻿er colored wire frame non-prescription glasses that are a perfect match to the nerdy spectacles of Dwight. ​No Dwight Schrute outfit would be complete without his signature calculator watch. This men’s calculator watch by Casio is nearly identical to the one worn by Dwight. ​Here is a replica flip phone that would be perfect for clipping to your belt just like Dwight Schrute, descendant of Dwide Schrude. Finally, if you plan to clip your flip phone to your belt like Dwight, you’re going to need a belt clip. This universal one by Arkon would be my recommendation.​ You can get a better look at it right here.